Toxfree is one of Australia's leading environment, waste management and industrial service providers. Toxfree’s core values, "Safe, Reliable and Sustainable", underpin a commitment to offer customers the safest, most reliable and sustainable waste management solutions. Toxfree, in partnership with Volvo Trucks rolled out the classroom safety campaign – Stop! Look! Wave! earlier this year. An initiative targeting Australia’s most vulnerable pedestrians, to help keep Aussie kids safe in their home towns. Since its launch, the interactive road safety campaign has fast became a global success with over 100,000 children learning how to interact safely with commercial vehicles in traffic. It’s particularly difficult for truck drivers to see a quick-moving small person, this was a key reason for rolling out this free education campaign to teach Aussie kids to STOP on the side of the road, LOOK both ways, and WAVE at the truck driver before they cross. We don’t want children to be afraid of traffic but their attention is limited, so we need to teach them this simple tip for crossing safely. The Stop! Look! Wave! campaign is important to Toxfree as, like Volvo Trucks, one of our core values is Safety. Our mantra is safe.reliable.sustainable with no harm to people or the environment. Toxfree has committed the resources of our own company with Toxfree trucks visiting schools across the nation to give students a look at the view from behind-the-wheel and to understand safety around trucks. There are thousands of waste and recycling trucks on the streets every day; a lot of them are out in the morning when children are heading off to school. As safety is a top priority for our drivers, they will enjoy being part of this children’s safety initiative that is new and fresh. Our drivers are always conscious of their surroundings and we want them to let the children know that they have gained their attention by waving back to them. We are proud to be sharing this initiative as a global partner of Volvo Trucks in Australia and thank them for their leadership in children’s safety. Recycling your e-waste is just as important as recycling any other waste material. Toxfree is a true end-of-life recycler of electronic waste. Our business model, technologies and processes ensure that maximum e-waste recycling and recovery processing takes place in Australia and that we do not export the problem. e-waste comes in many forms, including computers, photocopies, printer, fax machines, batteries and mobile phones. e-waste contains non-renewable but potentially toxic materials such as mercury and lead, that make it both an environmental hazard and a renewable resource. Ensure that your e-waste is disposed of at a reliable, ethical recycling plant. When handled correctly, at least 90% to 95% of e-waste components can be recycled, greatly reducing the environmental impact of landfill dumping, sourcing new materials, pollution and contamination. What does Toxfree do with e-waste? Toxfree delivers a true end-of-life solution for your e-waste. End-of-life means nothing is re-used; everything is destroyed as part of the recycling process. Our processes ensure the e-waste is useless in terms of information retrieval or re-use. Should you require a greater level of security, such as individual hard drive destruction, talk to us about a tailored secure e-waste solution. Our aim is to become the leading e-waste recycler in Australia and set a benchmark for all others to aspire to. Toxfree’s BluBox is a Swiss designed processing technology packed in a 40ft container. It is designed for next generation e-waste such as flat panel displays, smart phones, tablets and laptops however can also process a wider variety of domestic e-waste such as toasters and hair dryers. The BluBox process is designed to extract mercury from the LCD backlighting tubes utilising a sophisticated aspiration system to collect the mercury vapour and phosphor contaminated mercury. The process provides a fully automated solution to handle a wide variety of e-waste items from desktop computers and laptops, to toasters and hair-dryers. Toxfree developed, in-house, Australia’s first semi-automated CRT recycling system. The system which incorporates; crushing, density and x-ray sorting technologies, separates the TVs and monitors into their major recyclable components creating value added commodities. The process includes Australia’s only x-ray sorting system, an automated system to separate the lead funnel glass and lead free panel glass found in CRT TVs and monitors. Toxfree are experts in tailoring e-waste drop-off events for both business and communities. Whatever your e-waste recycling needs, Toxfree has the solution. This year, Toxfree Kwinana and Henderson branches helped their local community by participating in Clean Up Australia Day. We interviewed Craig Parfitt, Sales Manager at Kwinana, on the role Toxfree played. The Toxfree team on Clean Up Australia Day. For those who don’t know, what exactly is Clean Up Australia day? Clean Up Australia Day started in 1990 in which 300 000 people participated in picking up rubbish in their local communities all around Australia on a certain date. 16 years later the program has been responsible for picking up 288,650 tonnes of rubbish that would have been left to damage our environment. I have always been one of those people that find littering unacceptable and I thought it would be a great team event getting outside and helping the community and the environment in the Rockingham Beach area. How was Toxfree able to help? We were able to form a group of people from the TES Kwinana & WS Henderson branches to provide labor and a rear lift compactor truck to pick up the bags of rubbish from the Rockingham Beach and surrounding areas. We had some great feedback from the public as we picked up rubbish on the beach. Was there any strange waste you didn’t expect to see? We did find some stolen mail and parcels from an apartment block, which we reported to Australia Post. The Toxfree Reconciliation Action Plan (RAP) was recently updated and re-launched to the public. Our RAP focuses around building beneficial and lasting relationships with indigenous communities. Toxfree aim to hire indigenous staff where possible and provide them with training and support within our industries. Our RAP also looks to increase awareness around the indigenous culture and help all employees better understand the indigenous way of life. The RAP is an integral element of Toxfree’s approach in delivering improved outcomes for both Toxfree and Aboriginal and Torres Strait Islander communities. Toxfree has Indigenous employment initiatives, education and partnership agreements in place as well as promoting respect for Aboriginal and Torres Strait Islander cultures. The RAP will help to sustain reconciliation initiatives as a core focus for our company. On March 9 we launched our 2015-2017 Reconciliation Action Plan at our Coopers Plains site. We were fortunate enough to have a representative from Reconciliation Australia attend and speak about the importance of companies having a RAP. We were entertained by Shannen Ruska, Traditional Custodian of the Brisbane Regions and The Nunukul Yuggera Dancers who provided the ‘Welcome To Country’ and performed traditional dances and demonstrated how to make fire with sticks and dried grass. You can view our full RAP here. Photo: Nick Badyk with the The Nunukul Yuggera Dancers. The Toxfree Kwinana Team have proudly donated an unused fire hose reel from site to the Orang-utan enclosure at Perth Zoo. Orang-utans’ are extremely clever and very strong, so fire hoses are one of the very few items that they won’t destroy quickly. The fire hoses are a great way of providing more complexity to their habitat while increasing the amount of usable space in their enclosure. Donated fire hoses can be used to create structures such as platforms, hammocks and hanging ropes. The fire hoses provide opportunities to climb, swing and nest high above the ground as many primates would in the wild. Perth Zoo will kindly be hanging a plaque near the enclosure in thanks for Toxfree’s generous efforts. There are a wide range of products that we use in our homes every day that are potentially harmful if they are not disposed of correctly. These materials, known as ‘problem wastes’, include items like paint, car and household batteries and gas bottles. Old, leftover and unwanted materials like these require special treatment and processing because they cannot be placed in our kerbside bins. Toxfree has recently signed an agreement with Penrith City Council to open a Community Recycling Centre (CRC) at the Toxfree St Marys facility for local residents to drop off problem wastes free of charge. 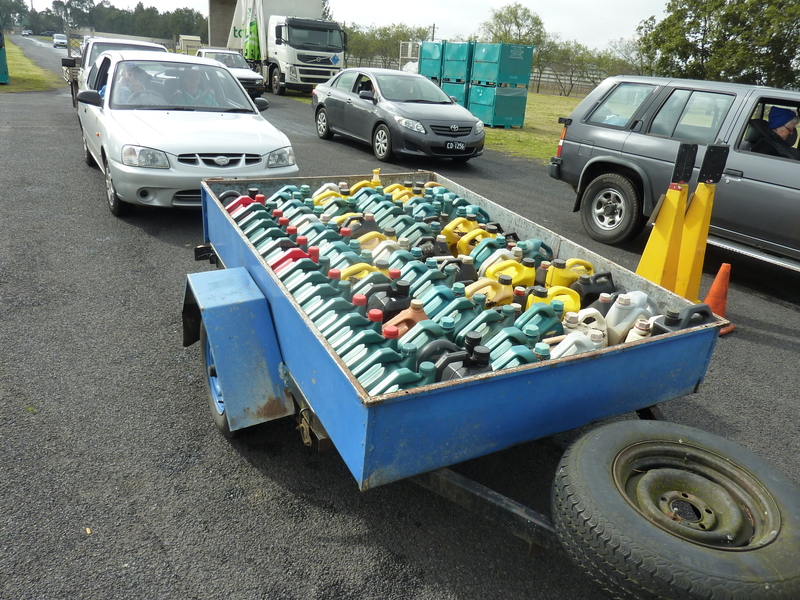 The Community Recycling Centre will be a permanent drop-off facility, open year round, for the safe disposal of paint, gas bottles, motor and cooking oils, car and household batteries, fluorescent tubes and globes, and smoke detectors. Many of the materials collected can be recycled if they undergo special treatment and processing. 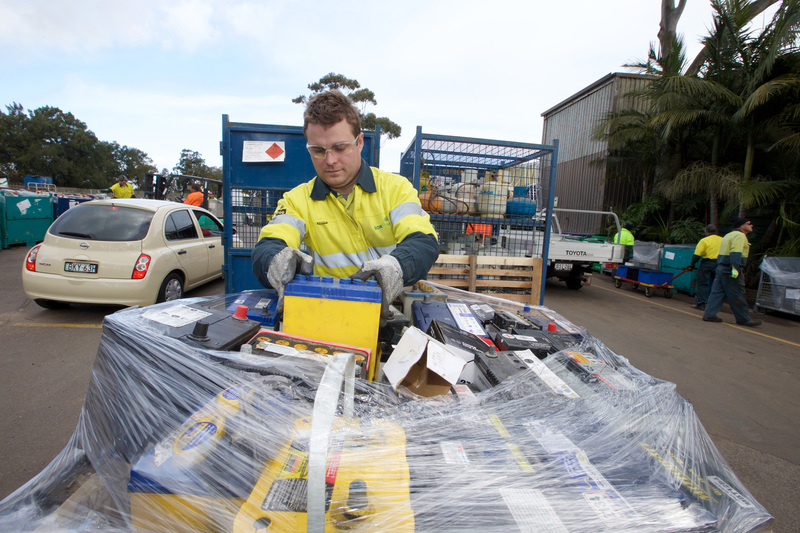 Community Recycling Centres are currently being established across NSW. Toxfree is working with the NSW EPA to deliver these services across NSW. The Community Recycling Centre will be complemented with Household Chemical CleanOut events to ensure the safe disposal of household chemicals. Toxfree provides a safe, reliable and sustainable collection, transport and disposal service of potentially hazardous chemicals and wastes. Toxfree has a strong relationship with NSW EPA and will continue to provide support in their initiatives to safely dispose of problem wastes in NSW. This project was supported by the Environmental Trust as part of the NSW EPA’s Waste Less, Recycle More initiative, funded from the waste levy. Toxfree Waste Services for Rio Tinto have just completed the one day Vacuum Awareness Course, which is an IFAP approved course. The course is a unique training experience developed through extensive industry consultation. Toxfree assisted in piloting the course within their service streams to contextualise to their business needs. This course is the first to be conducted on a Rio Tinto site nationally and was well received by all participants. Unmanned platforms that were once oil wells still stand five hours off Lakes Entrance in the Bass Strait. The ‘Perch’ and ‘Dolphin’ platforms are required to be maintained to ensure they remain safe and do not cause a hazard in the ocean. Part of the maintenance process involves checking the pipes that reach the ocean floor for wear and tear, specifically around their welding joints. In the past, divers have been sent down with high pressure water blasting equipment to blast away all the build-up on the pipes by hand. When the build-up has been blasted off, weak areas can be found and repaired to avoid any hazards. Tommy Daly and Trevor Mathieson from Toxfree worked with Dive Works to provide high pressure water blasting on the pipes with the use of a robot. Dive Work Solutions provided a Sea Eye Leopard ROV and a Sonomatic Mag-Rov, these were combined with the Toxfree high pressure water blasting equipment to complete the work. The robot removed the need to send down divers and by using a camera the entire process, which occurred 15 metres under the water, could be safely monitored and controlled from dry land. 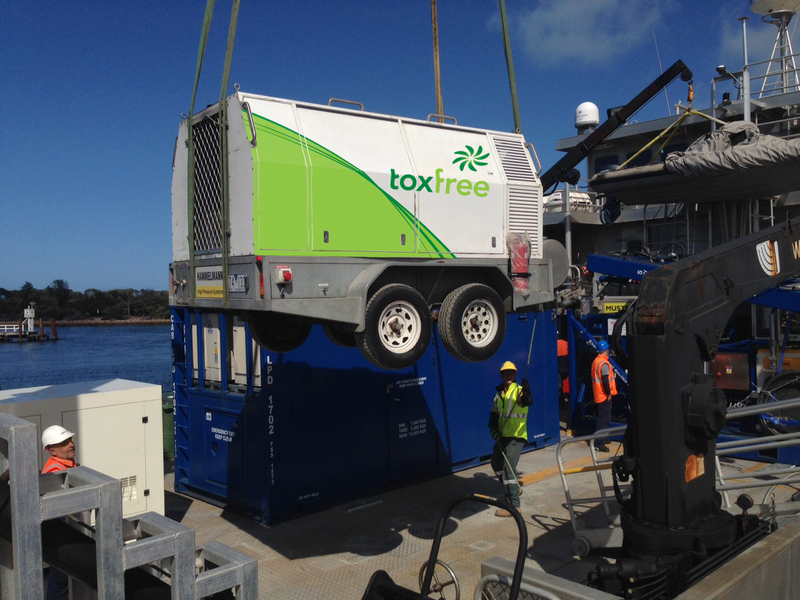 Toxfree equipment being loaded onto the boat, ready to be taken out to the platforms. During the process, a 2 metre section of pipe was found to be covered in calcium build-up, which is particularly difficult to remove. To overcome the issue, Toxfree combined the high pressure water blasting water with garnet, this created an abrasive solution that could cut into the calcium. The abrasive water was used on the pipe in a crisscrossing motion to break up the calcium, after that the normal high pressure process was used to remove the chunks of calcium, revealing the smooth pipe underneath. Together, Toxfree and Dive Works provided a safer and cheaper option to maintaining the dry wells compared to methods used in the past. The client was very happy with the outcome and that it was completed in a safe and well organised manner. The success of this project has led to further projects that are currently going ahead offshore. To read more about Toxfree projects, visit our case studies page here. Are you living in a toxic environment? Jesse Brown at the City of Sydney clean up day. In 2012, 75% of Australian households disposed of at least one potentially hazardous household item. The use of harmful chemicals is not just confined to industry application. Almost every household across the country will have some form of hazardous material lurking under the kitchen sink, in the garage or the garden shed. At the point when these chemicals are no longer required, Toxfree has the solution. Toxfree offers a service for the collection and disposal of hazardous household chemicals. Disposing of hazardous household chemicals is achievable throughout our network of national facilities. Through a combination of mobile collection events to permanent facilities, householders can confidently deposit their unwanted items and drive away with the confidence that their waste will be managed with the utmost respect for the environment and surrounding community. Specialist equipment is provided to cope with the collection of small items handed in by the public. Typical wastes are oil, paint, solvents, pesticides, cleaners, batteries, acids, alkalis, pharmaceuticals, pool chemicals, brake fluid, coolant, aerosols and photographic chemicals. All items are received by experienced operators specifically trained to understand the complexity of waste types and packages. The sorting is performed by industrial chemists who segregate the various waste types into compatible types for transport to the Toxfree disposal facility. Toxfree has been the preferred service provider for the national ChemClear program managed by Agsafe for over 10 years. The longevity and success of this contract for Toxfree has been through embracing a partnership approach where we work closely with our customers, providing a first class and tailored service to consistently exceed their needs. 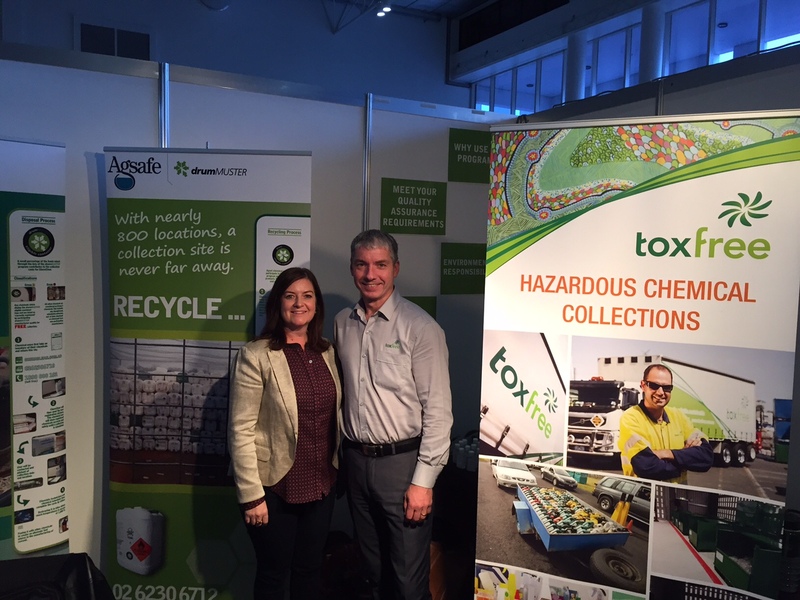 Toxfree recently attended the 6th Australian Landfill & Transfer Stations Conference with AgSafe to promote household hazardous waste recycling, including the ChemClear initiative. Lisa Nixon (AgSafe) with Tim Sheldon-Collins (Toxfree) at the Landfill & Transfer Station Conference. Toxfree is one of Australia's leading integrated waste management, environmental solutions and industrial services providers. Our core values of 'Safety, Reliability, Sustainability, underpin our commitment to offer our customers the safest, most reliable and sustainable solutions we can. Now spread across 50 locations within Australia, Toxfree's team continues to grow (now exceeding 1100) and our service offering just keeps getting better! You'll find us in all sorts of unusual places from the Class A Nature reserve of Barrow Island in the West to the brisk climate of Launceston in Tasmania. We hope you enjoy our stories.